GOP presidential nominee Donald Trump has been aiming his fire at fellow Republican Kelly Ayotte, accusing the U.S. senator from New Hampshire of being weak and disloyal. Matt O'Hara of Hooksett can't understand why Ayotte would continue to support Trump after he said Tuesday that he would not endorse her. "I certainly hope she would end any and all support of Trump," O'Hara said. O'Hara is not a Trump fan, and he thinks it's just a matter of time before more Republicans come around. "Once enough of them have fallen off at their support for him and perhaps retracted endorsements, it will then become a critical mass and they will all move away," O'Hara said. But Francisco Rodriguez of Nashua has a very different opinion. "Of course she should stick with Donald Trump," he said. Rodriguez says Ayotte represents the old political system, which he feels is killing the country. Even though he called her weak, he says she should stand by him. "She should show that she is loyal. She should show she's not weak. By sticking to her party and supporting the nominee." Rodriguez says it's the hypocrisy of the establishment who pledged to support each other just to keep their jobs. 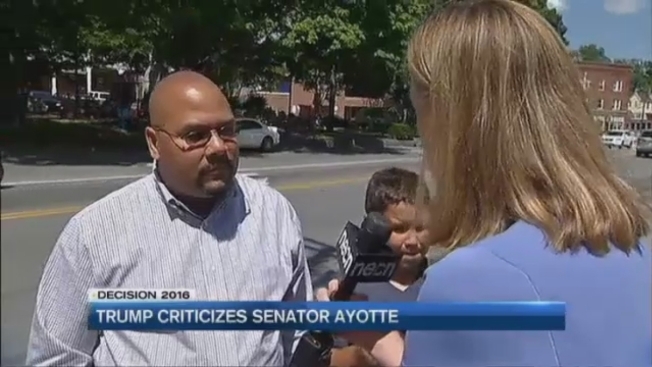 April Rescigno of Goffstown has yet a different perspective on Ayotte. "I think she's supporting Republicans. I don't think she supporting the man. And that's why she's backed off," she said. Asked if she thinks Ayotte should pull her support completely, Rescigno said, "I think if you pull completely back, she's going to lose too many people who are on his side. So there's a funny balance that she needs to keep." The Ayotte campaign says the senator has nothing more to say on the issue at this time.